WatchGuard Firebox M370 with 1-yr Basic Security Suite including WebBlocker, Application Control, spamBlocker, Gateway AntiVirus, IPS, Reputation Enabled Defence, Network Discovery and Standard Support. 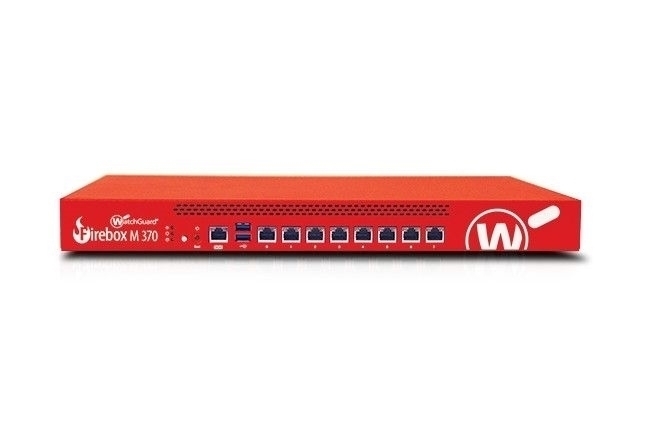 The WatchGuard Firebox M370 combines strong security, high performance, and flexible management tools in one affordable solution for small and midsize businesses. Its firewall throughput of 8 Gbps keeps traffic moving and with a UTM throughput of up to 2.6 Gbps, even with strong security enabled, it is the best in its class. The Firebox M370 boasts 8 1Gb-Ethernet ports and comes with flexible management tools to give administrators access through an inituitive console, scriptable CLI or the Web UI.